Bethesda closes the first day of E3 press conferences. How well did they do? Bethesda had a great show last year with the return of DOOM, Fallout, and Dishonored bolstering their lineup for the next year or so. This year’s show didn’t have that level of impact, but they found some new things to focus on this year. The two big surprises include the return of Quake from id and Prey getting rebooted by Arkane Studios. Dishonored 2 took the “One more thing” moment as Harvey Smith narrated a series of gameplay demos for the big fall release. Beyond that, we got a lot of info on new developments for DOOM, Fallout 4, Fallout Shelter, Elder Scrolls Online, and The Elder Scrolls Legends to show that they’re still committed to those games. Keep an eye out for staff impressions and the trailers from the show at the bottom of the article. Quake Champions – PC: Following the successful reboots of id’s DOOM and Wolfenstein franchises, Bethesda saw fit to start the show with the next logical id franchise to bring back with Quake Champions. Promising blazing speed at 120 hz and a mashing of the mythos of the first Quake with the multiplayer action of Quake III Arena, it seems like this game is poised to bring back another classic style of FPS that is all the rage with the success of Overwatch. The one weird part of the reveal is that Champions features titular heroes with various predetermined abilities and skills that will play differently that kind of ignores the original’s even playfield on that point. They’re planning on going hard with this game in the eSports realm, which starts when they’ll talk more about the game at QuakeCon from August 4-7. Prey – PC, PS4, Xbox One – 2017: The rumors about Arkane Studios working on a new Prey game turned out to be true, though instead of a sequel to the original, they’re rebooting it. This game takes place in 2032 onboard a space station as an alien force has taken over and it seems like this will be a first-person action game with a psychological focus, though it may not be as much of a horror title as the trailer suggests. It’s an interesting direction to take this franchise after the original was a weird archaic relic during the Xbox 360’s launch. Fallout 4 – PC, PS4, Xbox One – June/July/August – Though Bethesda just put out Far Harbor a few weeks ago, they’re not done adding more to the game. On June 21, they’re releasing the Contraptions Workshop pack for $4.99 that adds more contraptions and gadgets to the game. July has the Vault-Tec Workshop for $4.99 to let you build your own Vault that they show as a weird Fallout Shelter-style thing in the trailer. 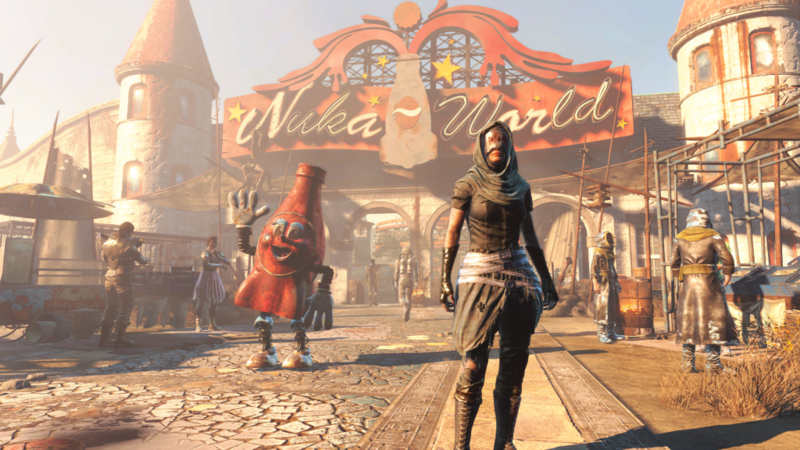 The biggie is Nuka World in August for $19.99, which is a big theme park that has been taken over by Raiders. These are all a part of the Season Pass, so those that grabbed it early on potentially got $70 worth of content for $30. Fallout Shelter: Much like its big brother, Bethesda is not done with its most popular Fallout game ever. The new update for the mobile version will be out in July and adds new locations, a new Quest system, and a new combat system. In addition to that, they’re bringing the game to PC with all of the updates intact and it seems like that may be out in the near future. DOOM – PC, PS4, Xbox One – Now & Soon – DOOM also got the post-launch support treatment during the show concerning SnapMap, Multiplayer, and a new demo. The demo harkens back to id’s history of shareware by offering the full first level to players to grab on PC, PS4, and Xbox One for free this week during E3. The limited nature of the demo is the worst part. SnapMap is getting some updates over the next few months to add a bunch of new stuff for level makers to make more cool stuff. Multiplayer is getting free updates to add new modes over the next few months including CTF, Capture, and three Free-For-All modes for that classic Deathmatch-style action. The first multiplayer DLC pack was detailed with new maps and a bunch of other stuff that’ll segregate the community in July. The Elder Scrolls Online – PC, PS4, Xbox One – June 14 through this Fall: Elder Scrolls Online joined the fun of big updates and DLC adding cool content with its fellow brethren. The Dark Brotherhood DLC came out on PC recently and will be out to consoles on Tuesday. The big announcement was One Tamriel, which is a huge update coming this fall that will remove all barriers to the content in the game so that you can easily group up with friends regardless of your individual levels and the world will adjust to how you want to play the game. The only part of the game it doesn’t affect is the PvP, which is to be expected. The Elder Scrolls V: Skyrim Special Edition – PC, PS4, Xbox One – October 28 – Not surprising in the least is Skyrim getting remastered for the new consoles while they wait for whatever Elder Scrolls game has to be in the works for a future year. You get the game and all of its add-ons included with everything being improved in terms of resolution, effects, art, and all of that good stuff. Mods are also joining the fun as Bethesda brings its Fallout 4-style mod system to Skyrim so console players can easily enjoy the many great mods people have been making for that game for several years now. PC also gets in on the fun as owners of the game and all DLC or the Legendary Edition on Steam will get a free upgrade to get mods and whatever else is new here on October 28. Dishonored 2 – PC, PS4, Xbox One – November 11: Dishonored 2 took its place as the Fallout 4 of this year’s show at the end as Harvey Smith talked about the game on stage and narrate the demos they had on hand to show off the various aspects of the game. It’s probably best for you to check out the video to get all of the info contained in the demos. In addition to the demo, they also announced the Collector’s Edition that includes a replica Corvo mask, a replica of Emily’s ring, a poster, a metal case, the digital Imperial Assassin’s Pack, and Dishonored: Definitive Edition for $99.99. For a limited time, digital pre-orders of the standard edition of Dishonored 2 will also receive the Definitive Edition of the original for free on PSN, Xbox Live, and presumably Steam. They capped off the Dishonored 2 talk with the official Dishonored 2 gameplay trailer that was a great way to end the show. Bethesda VR – HTC Vive – It was nice to see that Bethesda is joining the VR world with demos at E3 for Fallout 4 and DOOM retrofitted for VR, but the one bad move you can make for VR is to try to shove it onto old games that were not designed for that kind of experience. Fallout 4 is confirmed for a VR release sometimes within the next year and will be exclusive to HTC Vive as far as we know, which is also an issue of not supporting multiple VR headsets. I’m excited for the new things they can make in the vein of their first-person RPGs, but this seems like more of a shortcut than the real deal to me. The Elder Scrolls: Legends – Android, iOS, Mac, PC – Beta Out Now – If there was one game at this show that stuff out as not interesting, it was Bethesda’s attempt to make their own version of Hearthstone that seemed like it was on a lower level than everything else that was featured. It could be a really cool game, but it clearly stands out as something that doesn’t fit their portfolio at the moment. It was definitely a more impressive show than EA and one that follows up last year’s show quite well, though it was mostly derivative of that same show with only two new games to announce.